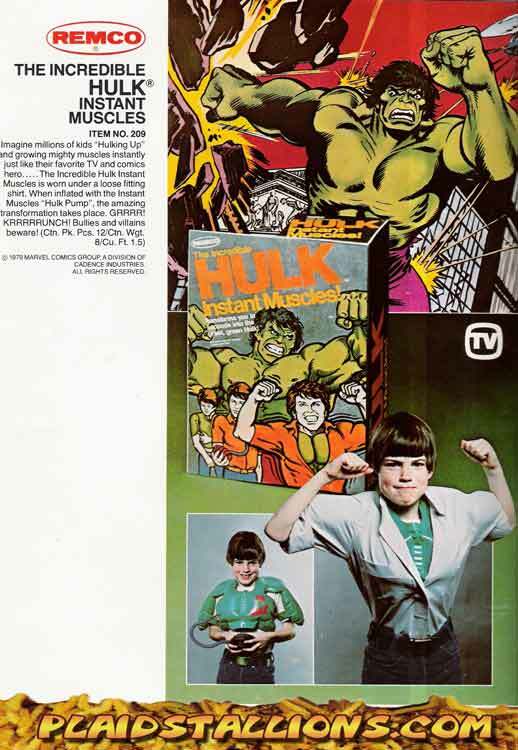 The 1970s was an absolute windfall of Marvel comics merchandise, the house of ideas sold out and we were better off for it. By 1976, the Marvel comics license was shared with dozens of toy manufacturers all vying for our parents hard earned money. Here are top ten of the best Marvel comics toys from a time when a big screen Avengers movie would have starred Reb Brown and Lou Ferrigno. These had absolutely nothing to do with the comic books but who honestly cared? 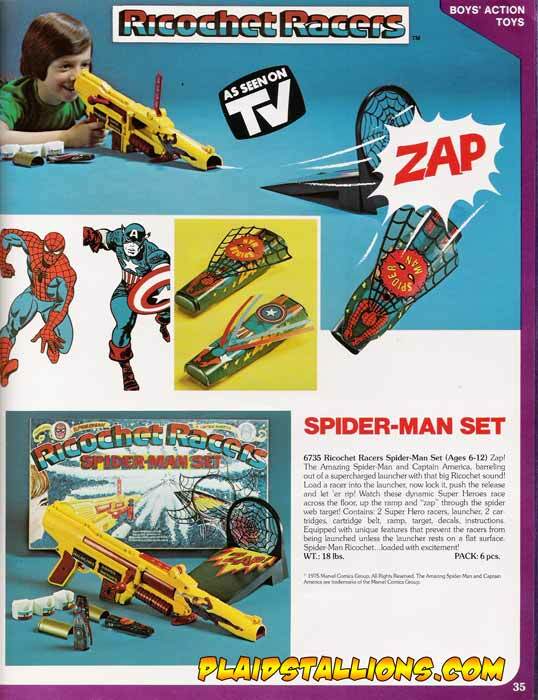 Ricochet Racers were rifles that shot cars featuring the likeness of Spidey and Cap. Joyous! Mego was amazing when it came to superhero merchandise but this entry in the "Comic Action Heroes" line is just downright surreal and creepy. 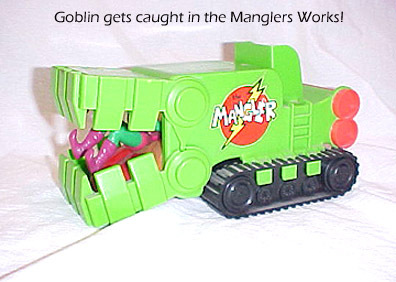 Looking like a zamboni with teeth, the Mangler's function was to have Spider-Man knock the Goblin into it's jaws and the Goblin would come out the other end flat as a pancake. We'll assume that his organs and precious life fluids would pour out into a storm drain. 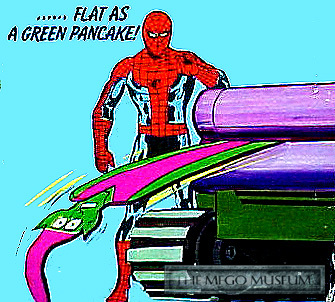 Check Out the The MegoMuseum Mangler page for more. Colorforms produced some of the coolest sets for the Marvel heroes including this puzzleforms set, which featured a good chunk of the universe. 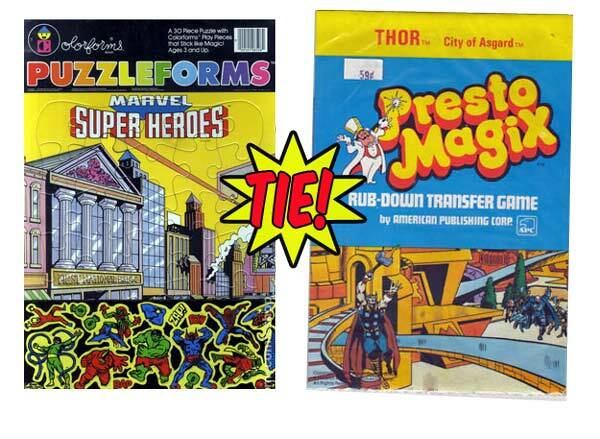 On the flip side, we had Presto Magix transfer sets that gave many of the Avengers some much needed marchandise. Hours of fun, low cost and variety. That's what it's all about. It's downright awesome and a little curious that Ben Cooper made and sold a costume of Hitler's right hand man but as a lifelong Captain America fan, I love it. 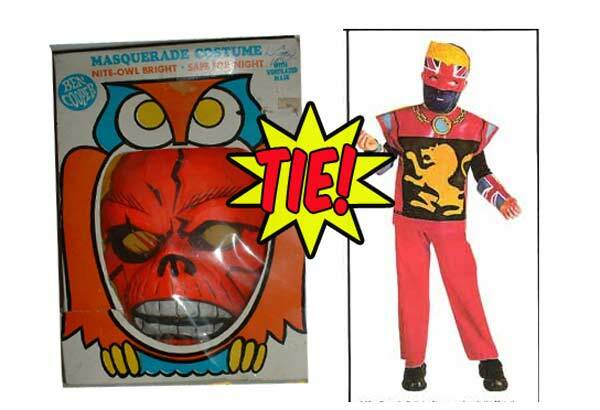 Equal kudos go to Berwick for producing a costume of their homegrown superhero Captain Britain. 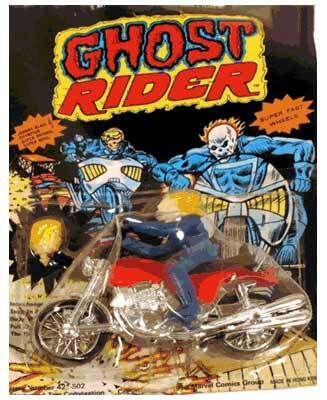 While Ghost Rider Toys are a no brainer now, you really have to appreciate that Fleetwood Toys took a four year old character from a middling selling book and made a rather spectacular rack toy. 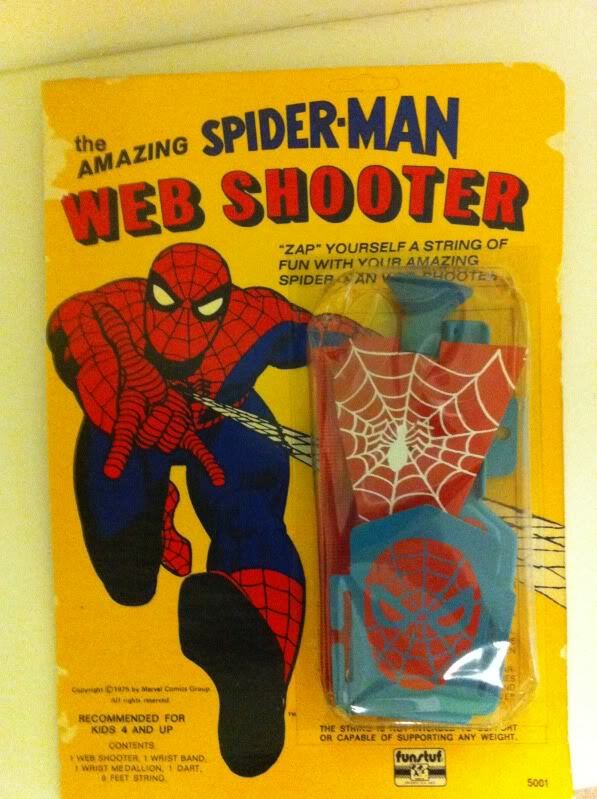 If you're talking role play items, Spider-Man's webshooter ranks up there with Thor's Hammer and Cap's shield. Kudos to funstuf for making this happened in 1977. The company predictably made variations using cap (shield shooter) and the Hulk (Flying Fist) but this original item is the best of the bunch. UK toy maker made some killer diecast items and really went the extra mile with the Marvel license like giving Hulk one of the most logical Hulk vehicles ever (ie one where he wasn't driving!) and giving B lister Captain Marvel some much deserved love with his own Porsche. 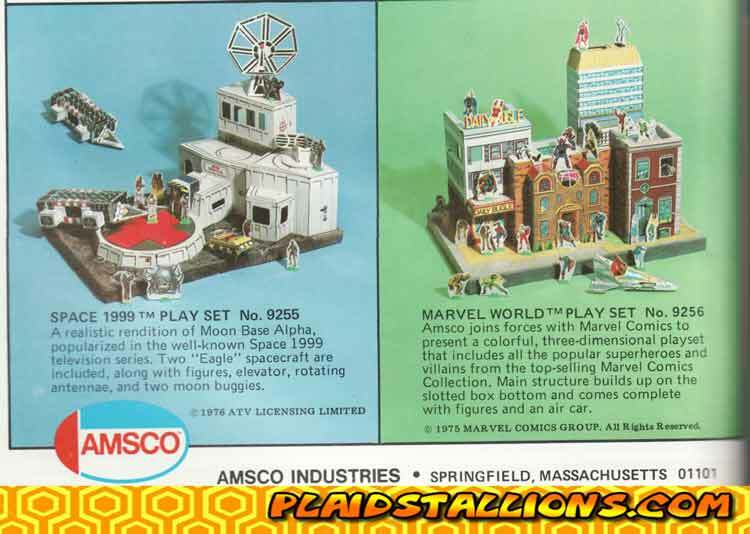 Amsco made a series of cardboard playsets in the 1970s based on licensed properties like Planet of the Apes and the Waltons but the belle of the ball was Marvel World. Attention to detail on these playsets was bar none, with not only a broad character selection but background items like the Baxter Building, the Daily Bugle, Avengers Mansion, even Dr Strange's House! If you're a child of the 1970s and loved Superheroes it's impossible to not think of Mego, the undisputed king of the 1970s action figure. 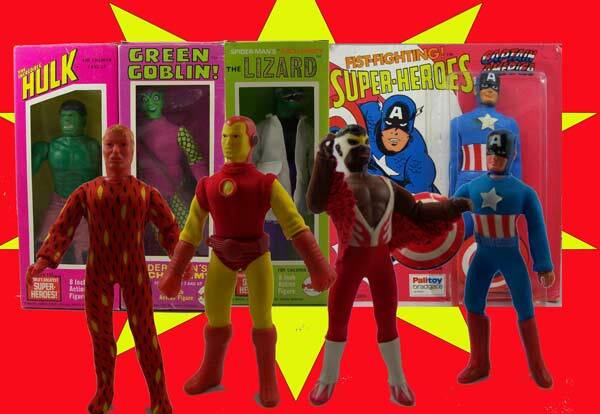 The Mego Superhero universe was really the first of its kind and included a ton of Marvel characters (The Falcon?) that kids weren't expecting. 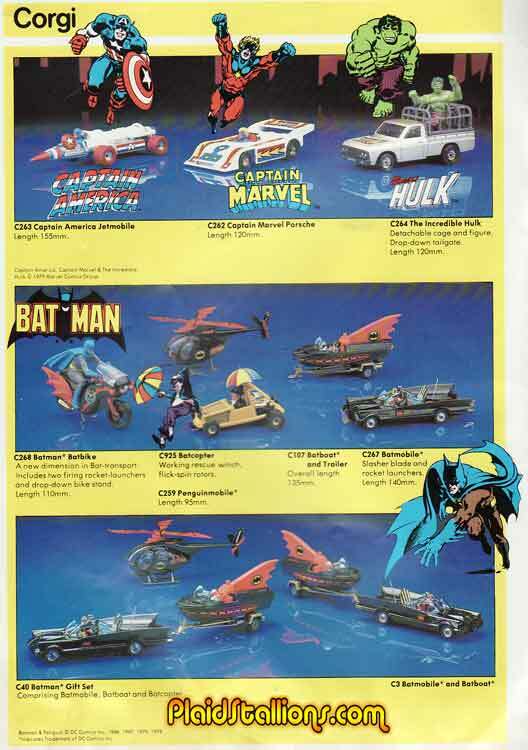 Best of all, the 8" format allowed you to expand your universe to include all the DC heroes (who were happier looking but at the same scale) and other lines like Star Trek and Planet of the Apes. I've said it a million times but Captain America and Tarzan teaming up to defeat Dracula and Dr Zaius, that's a happy childhood.